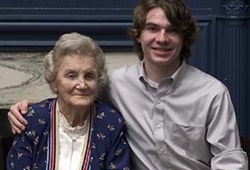 Irene Lundy Brown '39 and Robert Lynn '08 met during a special luncheon in April 2005. In the spring of 2005, a freshman art student met the Mary Washington alumna who funded his Washington Scholarship. Now a practicing attorney in Washington, D.C., Robert Lynn '08 expresses his continuing gratitude for the gift of education he received through the generosity of Irene Lundy Brown '39. "I think of Irene almost every day, and I am very glad I got to know her," Robert says. "I'm grateful for the opportunity that she and UMW gave me. Without the scholarship, I can say with certainty that I wouldn't have gotten the chance to do what I do now." Irene funded the first of eight Washington Scholarships, each of which provides full tuition for the most qualified Virginia residents attending Mary Washington. During her lifetime, Irene served in numerous leadership roles at UMW, including service on the Board of Visitors and the Foundation Board of Directors. She also received the Distinguished Alumna award, the Alumni Association's service award, and an honorary degree in humane letters. Irene was extremely proud of her scholarship, and she enjoyed meeting its recipients. She passed away in 2006, but her legacy as a scholarship donor and member of the Heritage Society continues through the lives of each and every student recipient. Robert graduated from UMW in 2008 with a major in studio art, and he spent an extra semester at UMW preparing his art portfolio and finalizing a second major in art history. But then he seemingly switched career paths. "I started applying to various graduate schools, and I eventually chose to attend law school at the University of Virginia," says Robert. While switching from art to the study of law may sound dramatic, Robert says it's all related. "At UMW, I learned to write strongly and to research interesting issues. I also learned how to be a self-starter and take on a project and make it as big as needed while thinking outside of the box." He gives a lot of credit to his UMW professors and the work ethic he developed for success in the art programs. "The classes for my majors in studio art and art history were demanding and time-consuming," he says. "I was passionate about my work, so — while I didn't know it at the time — this turned out to be great preparation for law school." After receiving a juris doctor degree from U.Va., Robert passed the bar exam in Virginia and Massachusetts, and he is now a corporate attorney at Cooley LLP in Washington, D.C. He says he continues to paint, write, and do woodworking on the side, but his legal work is creative as well. "Cooley is a technology law firm, and my practice area is emerging companies and venture capital," says Robert. "This means every day I get to work with creative startups trying to change the world." Washington Scholarships for in-state students may be established with gifts or pledges of $600,000. Alvey Scholarships for out-of-state students may be established with gifts or pledges of $1 million. Presidential Scholarships and other named, endowed scholarships may also be established for future students.